Dear Diva, I really dislike having to clean my hardwood floors by hand. Seems like no matter how much scrubbing I do, I end up feeling it more than the floor ever did. I could hire someone to help, but isn’t there some kind of Roomba robot that will clean hardwood floors like the robot vacuum cleaner handles carpet? Help! My back cannot take much more of this punishment. Dear Frustrated, I know how you feel! In fact, lately I’ve been doing my research to find the perfect floor cleaner to solve both of our problems. Don’t get me wrong, I love my wood floors, but some days it seems like an “act of congress” just to keep them clean. This is especially true during the holiday season when guests are arriving. You want your floors to look good, but you don’t want to spend your whole time cleaning them. Get it clean the first time – The Mint Plus tracks where it cleans using something called the NorthStar Navigation System. This allows the floor cleaner to move carefully back and forth making sure your floor is being cleaned properly, the first time. It’s times like this that I remind myself how great technology can be to have around. Not only does the Mint Plus clean the floor for you, but it makes sure to clean the entire floor without missing a spot. 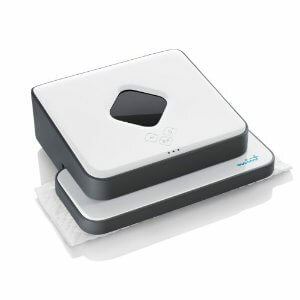 Dual Modes – Unlike similar robot cleaner models, the Mint Plus was designed with versatility in mind. There’s a sweeping mode and a mopping mode. In both modes, the Mint Plus uses eco-friendly microfiber cloths or disposable pads like those from Swifter. What I really like about this design is that you can choose whether or not you are going to be eco-friendly. If you are concerned about the environment, simply wash and reuse the microfiber towels. This also means that if you aren’t finished cleaning your floors but your microfiber cloths are dirty, you don’t have to wait to finish cleaning until you’ve had a chance to run the wash. This type of versatility in both cleaning modes and pad type is great! No missed spots – Because Mint Plus is so compact, it can clean the areas where a regular vacuum or mop is not able to reach. This is a huge benefit all by itself. Designed for real life – The Mint is pet safe and stair-aware. There is no need to be concerned about it mowing down your pet or falling down a flight of stairs as it completes a cleaning cycle. In addition, it is also whisper quiet. This feature alone would make it more pet friendly in my household. Cleaning on the cutting edge – The Mint Plus Floor Cleaner has a knack for cleaning right up to the very edge of an object, unlike other cleaning tools. So Mint is able to easily navigate around table legs or even protruding appliances. This is something that the manual wood floor cleaner (me) can’t even do without bumping into a table leg or two! Great battery life and easy clean up – The Mint Plus cleans for up to three hours and requires next to no cleanup itself. Unlike similar devices, the Mint Plus is not going to require any real cleanup after completing a cleaning cycle. Just remove the cleaning pad and plug it in to charge. Reasonably priced – At around $299, the Mint Plus Floor Cleaner is not as cheap as getting on your hands and knees and cleaning the hardwood floors ourselves. But something tells me our backs will thank us for it later! Plus I’ve been told that once you’ve tried the Mint Plus, you won’t be going back to your old floor cleaning routine again. It’s also important to note that there is a lesser priced Mint Floor Cleaner model that starts at around $199. One last note about why I choose this particular floor cleaning model. First of all, it appears like it does what it says. The Mint was reviewed well, on average it received 4 out of 5 stars. That’s pretty good for any type of cleaning product and good enough for me to invest my hard-earned cash into. I also figured that while the $299 is more expensive than it would cost for me to manually clean my hardwood floors (on my hands and knees), it’s probably cheaper than the cost of having to go to the chiropractor in case of injury. And don’t forget that with the holidays being just around the corner a robotic hardwood floor cleaner could make picking up after guests easier and less time-consuming. Which in turn may give you more time to spend with your loved ones. After all isn’t that what the holidays are about?